"I have had the privilege to convey some different clients, I encountered in my capacity as a psychiatrist. In this regard, the results far exceeded the expectations of both me and the clients. I have seen Jørgen demonstrate how a change may occur in individuals with severely disabling mental barriers. " 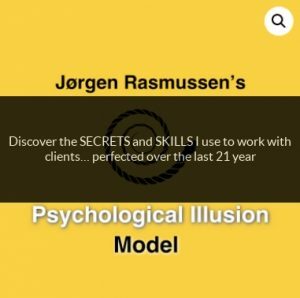 Jørgens solid theoretical knowledge background in different fields such as psychology, Hypnosis and NLP is extensive. His way of helping people to find their resources inspires trust. 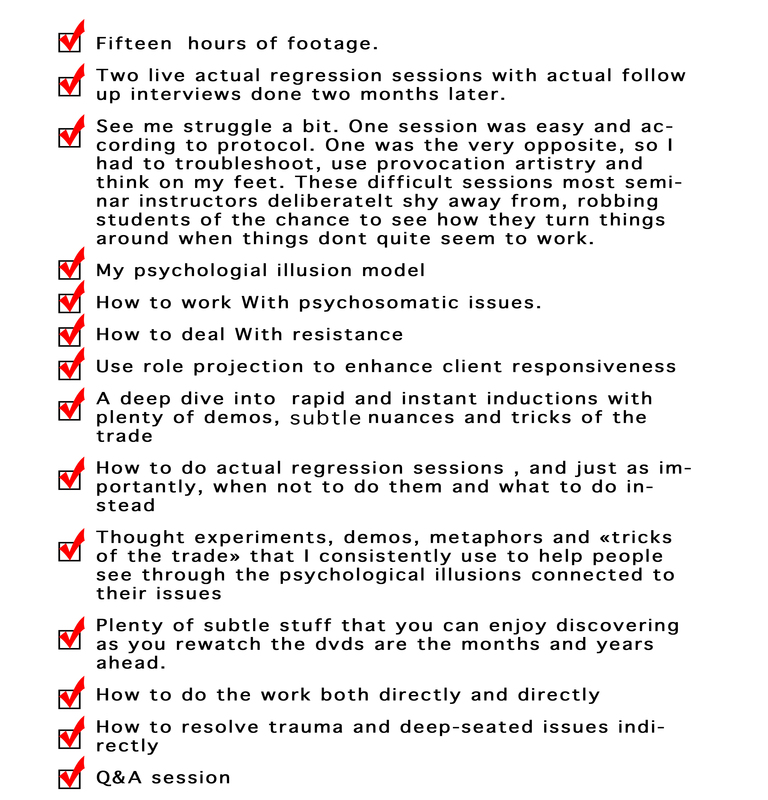 WOULD YOU LIKE TO CONSISTENTLY GET RESULTS WITH YOUR CLIENTS THAT ARE CONSIDERED MIRACULOUS ….AND A ROAD MAP FOR HOW TO TROUBLESHOOT AND ADAPT WHEN YOU FALL FLAT ON YOUR FACE?…. WHY GET THESE DVDs ? OK, WHAT ARE THE PREMISES HERE. UNFORTUNATELY, most of the people using regression work are stuck in the 1950s . They use a mental illness framework when working with clients. They are usually not up to speed with modern research on memory, and they work at the level of archeological digging….working at the level of CONTENT ( what happened and what the client thinks ). Those fortunate enough to have quality nlp training ( thats rare indeed ) know to work at the level of process ( how people think and make meaning ). HOWEVER, what I am about to teach you works at the level of «psychological illusions» , helping people discover the illusory nature of their experience, which takes the work to a whole new level. WHY, YOU ASK: consider the following analogy. Lets say that you are sitting at the projection booth at a movie teathre having a strong fear when watching a movie. You could play with attempting to change what you think, you could attempt to manipulate the qualities of the film,BUT what a difference it would make if you suddenly realized the illusory nature of film. In a way, the teachings here combine the old and the new, east and west. We combine the most powerful tool of western hypnosis with pointers towards the spiritual truths that eastern teachings have pointed towards in non duality teachings, dzogchen direct path and the discoveries of the Buddha over 2500 years ago. We combine that with modern psychological research into memory, heuristcs, and meaning making, making this product different than anything else currently on the market. 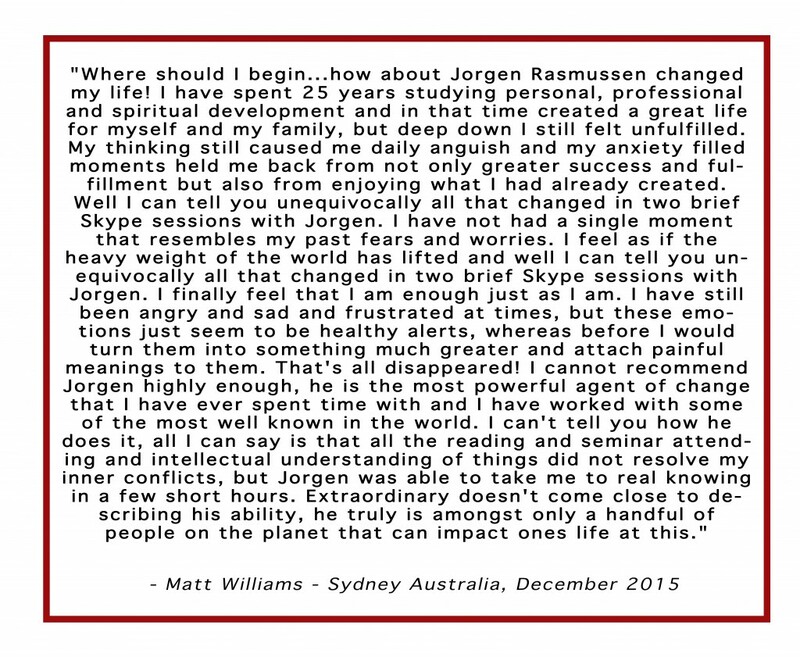 Here is a client testimony from a guy who had worked with some of the most well known coaches in the industry live, who I was able to help with two sessions on Skype. "You reader are in for a treat - this is the stuff of genius"
He gets results. And not only that, he can show you how to do the same very same. I am re-reading Provocative Suggestions, and I am finding lots of gems I missed on my first reading. This book, along with Provocative Hypnosis is full of very practical tips very valuable to anybody interested in changework. Just the chapter on managing client's expectations is well worth the price of the book. Strongly recommended!